How to manage app localization ? 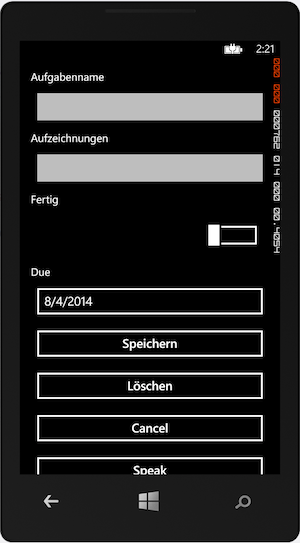 What are the guidelines to manage apps localization using Xamarin.Forms ? Each platform has its own localization process (RESX on WP, XML on Android, etc.) so how to do that localization part on the main Xamarin.Forms project of a solution? Nobody is doing localization for now ? ...if you want to try translating strings in Xamarin.Forms Xaml. I used Vernacular to manage the localization process. I'll check that, thanks ! @CraigDunn‌ Can you please share steps on how to go about getting Vernacular working. I merged a patch to vernacular yesterday allowing it to work with X.F. docs follows. Hi @StephaneDelcroix‌, there is any advance in that documentation to work with Vernacular and Xamarin Forms? I'm interested in this documatation too. Are there any plans for Xamarin to provide a translation extension for X.Forms that works directly with the native resource file formats? @anotherlab‌ Vernacular by rdio does just that (uses native storage but exposes a nice C# API). The gist I posted earlier shows how to expose the catalog Vernacular creates to Xaml using a custom markup extension. Vernacular does work with Xamarin.Forms though, which is a great start. At some point we'd love to formalize & document how this works - it is in the queue but there is a lot to do! @CraigDunn, I looked at your gist and I saw how it works with Vernacular's string formats, but if you are using a tool like MAT to manage your resource strings, you now need a mechanism for translating the RESX or XLIFF files to the Vernacular format. Are there any documentation or examples for Vernacular? The Vernacular.Tool command line app provides a few conversions between common file formats. Vernacular uses a standard format - POT/PO - so it shouldn't be a big deal to convert. There's not much official documentation on Vernacular, though you will find examples on the web. It is open-source, so there is always the code to look at. It's a powerful tool that does a nice job with L10n problems like plurals, gender, ordinals, etc. so worthwhile understanding. 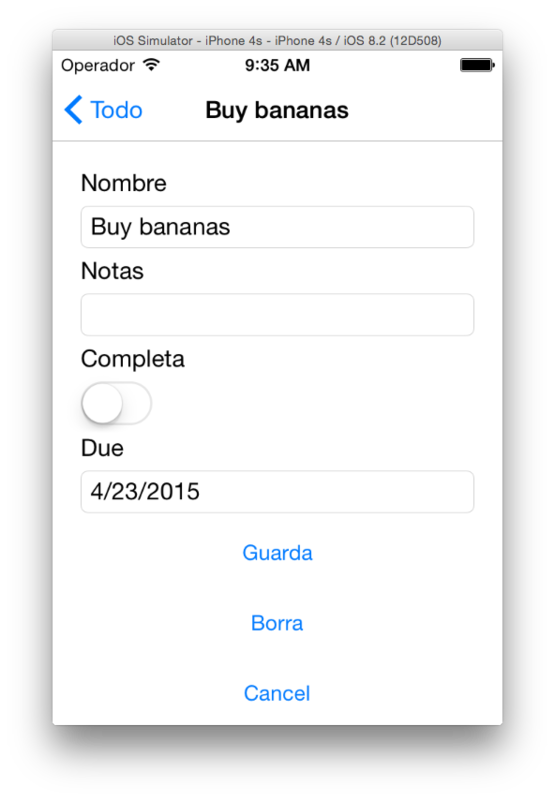 Update: here's a working Xamarin.Forms app using Vernacular for localization. TranslateExtension enables the localization to occur in the Xaml. If you build UI in C# you just need to use Catalog.GetString (someText) to populate user interface elements' Text properties. Vernacular also supports other methods like GetGenderString and GetPluralString. Check these slides and this MonkeySpace talk video by @AaronBockover‌ for info on Vernacular. 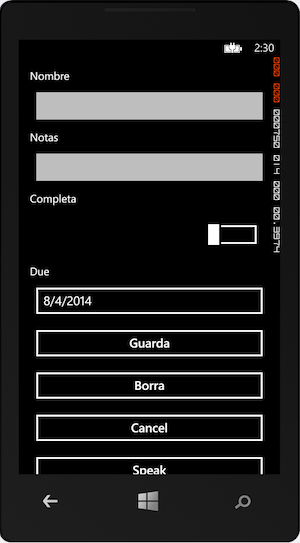 Update: here's a working Xamarin.Forms app using RESX for localization. The RESX language files are all embedded in the PCL as Build Action: EmbeddedResource. All the localized strings are retrieved though this Localize method. It uses an ILocale interface to determine what language is being displayed. There is an iOS and Android implementation of the interface that is registered with the DependencyService. Note that you could implement the Xaml TranslateExtension just as easily with the RESX method as you can with the Vernacular example. I'm currently testing Xamarin.Forms and want to localize my app. I'm not using MVVMCross or something like this : only plain .Forms. I saw Vernacular, but for now, we don't want to rely/use other third party library other than Xamarin. I've followed your example to use the RESX as source for localized texts, but I've come to a problem: it works on Android (myabe on iOS, nothing to test with for now), but it does not works on WP... Your example does not works on WP either. whatever the CultureInfo (default is "en-US") I pass (CultureInfo.CurrentCulture, new CultureInfo("fr"), new CultureInfo("fr-FR")) to the ResourceManager.GetText() method, I always get the english translation! Does anyone have an idea explaining why it does not works? Screenshots attached show the app in Spanish and German. Yes, that's exactly what I did (in my app or in your sample), but the GetString() method of the ResourceManager always gives me the English translation... Even if y use GetString("label", new CultureInfo("fr")); whatever the language I pass to GetString, I get English! I test it on the WP emulator, set it's language to "French" and country to "France". Found the error: in supported languages on my WP project and WP manifest, I set "French (France)" instead of "French", because I have a resource file marked as ".fr.resx". Note that you can use code generation on your resx file and simply use Resx.AppResources.Something, it works on Android and WP (once I set the correct supported cultures) for me. Wanted to give some feedback using Localization with Resx .. It only worked when i changed the culture on the phone .. so it seems ResourceManager knows somehow already the correct culture to load ?! well actually i was wrong, you still need to set it.. I approached this issue in a different way as my problem required me to do a reverse look up (get the text on the screen, find the look up token originally used and then work with that). With the locale code, I can use the system with any language available through Google translator. The table is preloaded with the text used within the app, and accessed through by StringUtils.GetString (all it does is look up the token and return the localized string). The difference though is that if the text being requested isn't available, google supplies it and the app records it, so next time it's there. As it has a value parameter, the localized text can be read in from the screen and the key returned. While this may be slower, the system will always learn so if you miss something, as long as the native one is up to date, the translation can be obtained. If you have issued with the namespace that is incorrect on Xamarin Studio, with a runtime error message like "could not find any resources appropriate for the specified culture or the neutral culture". 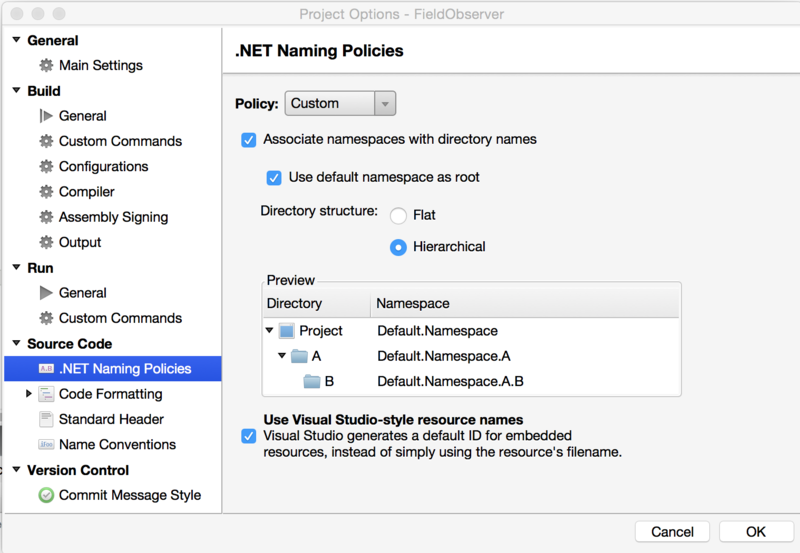 It's because Xamarin Studio default configuration is not using the folder structure to create Namespace. So if your "resx" files are in a folder like "AppResources" for example, your designer.cs file must be have the code System.Resources.ResourceManager("MyProject.AppResources.TextResources",...) and if your settings are incorrect, you will have System.Resources.ResourceManager("MyProject.TextResources",...). To change that, you can go to Settings > .Net naming Policies, and activate the folder structure. You will need to recreate your files again after that to ensure it's working fine. @CraigDunn I used your sample to get the locale working on iOS and Android, and it's fine. Nevertheless, you don't use the designer.cs file that is nice to get the key of the strings that are available from the resx main file. So instead of L10n.Localize("SaveButton", ""), you can use TextResources.SaveButton, which is verified at compilation time. In that case, you can initialized the TextResources culture, using the following code, and the class L10n is no more needed. @CraigDunn‌ Yes. In order to better follow the Visual Studio default configuration, perhaps it woulkd be good to activate it by default on Xamarin Studio? Late to the party, but just as another perspective I am using the Multilanguage App Toolkit along with a markup extension for Xaml (described above). Seems to be working fine. Using Resx and following TodoRessx sample file worked for me. But is there a way to change the languages of default texts in the device like the "Cancel" button of the Camera? It doesn't directly change when you change the phone language when you build an app in xamarin. Is there any way to access the .text property of those? Thanks. Up to now I use Vernacular. Great tool. But now I have a problem, which I couldn't can solve. I want to localize the files for the preferences. For Android it's no problem. But the setting files from iOS aren't scanned and generated. How could I do this (it's best to use Vernacular)? Not sure Vernacular already knows about Root.plist and Settings files, so I'll think you have to create your own Root.strings file (and others if you have sub-pages in settings). The best place to look is Apple's docs for Settings... scroll down to the localization part. BTW: If you're testing this app (TodoL10nResx) on iOS simulator 8.1 it'll always return en locale. It's a known issue with iOS 8.1 simulators. But when I use Vernacular Command to create .POT file, it is not able to Scan IOS Keys (e.g. EditProduct_IOS) as in Windows Machine, the #If IOS section not able to Scan as it is not Active. You should scan both executables (iOS and Android) with one call to Vernacular. With this, you get all strings in one POT file. Later you could generate with the translated PO file the files for iOS or Android. I'm not at my computer, but if you have problems to do this, I could send you the command. Thanks Charlenni for the reply. Actually I am having the commands. But my question was that with that command it was not able to scan IOS key in the "if" conditions. Anyhow I am able to scan both the key with out any changes. It is bit strange but it working now. So you get the strings from if and from else. @CraigDunn could you tell me how to implement Resx Localization in Shared Projects (not PCL)? @ChristophThiel I just converted my sample to a Shared Project and put it on github -> TodoL10nShared. The Resx folder has the exact same files as the PCL version, with the same Build Action: Embedded Resource. Because shared projects don't actually have an assembly of their own, you have to make the iOS and Android (and Windows Phone) projects all have the exact same default namespace and assembly name. Also, what's the proper way to switch app language on the fly? I.e. Phone's language is set to English but when I load the app the user might want to switch the language to Spanish (updating the UI with proper text). We have found that switching language on the fly is pretty horrid. While I have no experience using Vernacular, we use the .resx method described above. This will make all newly instantiated pages display in the new culture, but wont affect any existing pages.